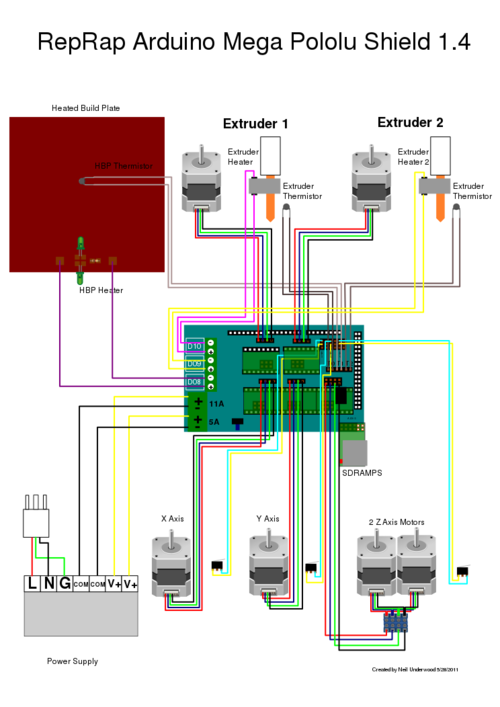 The goal is to separate a single module dual head extruder into 2 separate extruder heads each independently controlled by their own X or Y carriage. Edited 2 time(s). Last edit at 06/03/2015 11:50PM by Aaagogo. When you´ve managed to implement it in Marlin, how would you tell the slicer you have two independent extruders? If it´s just about printing dual color at higher speed, you better build a second printer and reach that goal easily. // instead of X/Y in their name (those are dual drive specific). The math is easy: each hotend has 40W . At 12V this is 3.33A. You only have a 5A fuse. One extruder has to be powered and controlled by a relais. It wasn´t necessary to power both hotends at once, because the slicers I know only generate code for one nozzle at a time. I have to apologize, I didn´t know, that Marlin has such settings. A second x-axis would be the easiest adation. Just put two frames vis-á-vis on one y-carrier. But still I don´t see the benefit. Edited 1 time(s). Last edit at 06/03/2015 11:02AM by o_lampe. It Will power both hotends at the same time... The fuse is fine. Hi, i trying to make a dual x carriage prusa 3 using ramps 1.4, how i can identify the pins numbers i can see on marlin firmware configuration_avd.h and pins.h on the ramps? 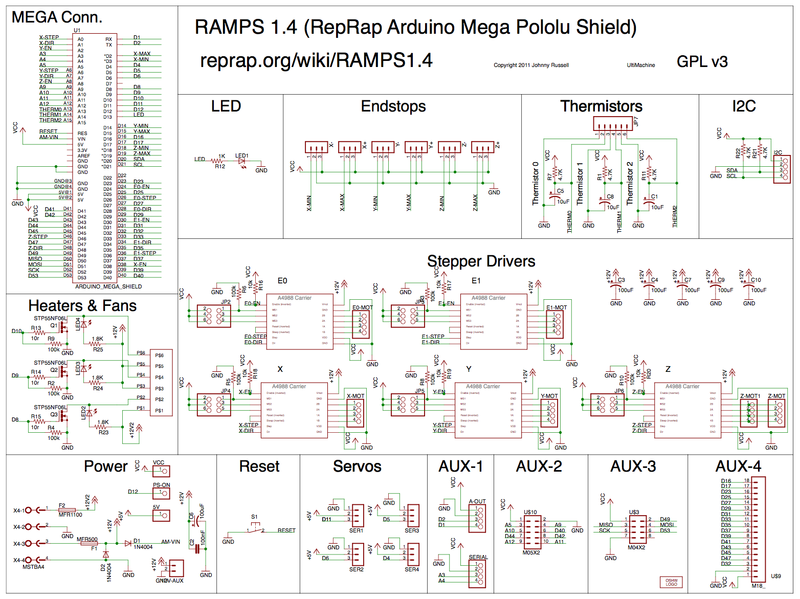 because i can find an schematic of ramps with that pin numbers. for example 29, 25 and 23 (the default for dual x). The schematic is here in the first post. The pins 23, 25, 29 are all located on AUX4. 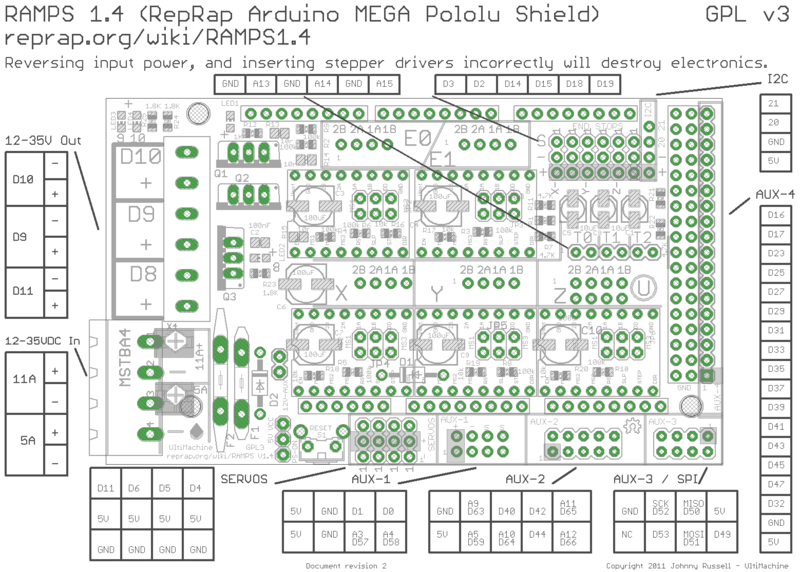 I am looking for a way on how to add one additional stepper driver for my MKS gen v1.3 board (Ramp1.4 compatible). It seems that your idea might be one solution for me. How was the result? #define __EPIN(p,q) how can i fix it? How about the resoult?Which a few pins need to be changed?I am hacking my RUMBA board.Anyone can help me ? Edited 2 time(s). Last edit at 11/28/2017 12:17PM by 3DLTech.